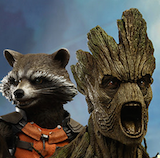 Hey there, True Believers! 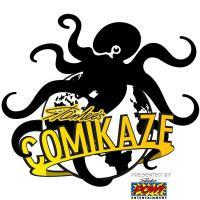 The Topps Company and Stan Lee's Comikaze Expo are teaming up to bring MARS ATTACKS to Los Angeles! 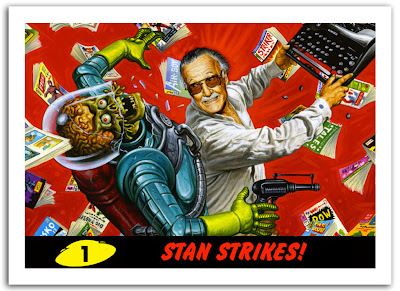 Topps, setting up shop at Stan Lee's Comikaze Expo for the first time, will bring an exclusive MARS ATTACKS trading card featuring Stan Lee himself facing off against their iconic Martian invader! Limited to just 2500 cards and fully painted by Joe Jusko, the card entitled "Stan Strikes!" 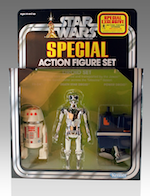 will be given away FREE on a first-come-first-served basis and available ONLY at Comikaze! "In 1962 when Mars Attacks was making its mark on the world of trading cards, Stan and his stable of sensational superhero stories were transforming the landscape of comic books," said Topps' Adam Levine. "I can't think of any better match-up than these two pop culture icons to face off in the most outrageous, out-of-this world trading card crossover we've ever seen!" Topps will be on hand at Stan Lee's Comikaze this Nov 1-3 to promote the release of Mars Attacks: Invasion, the modern revival of the classic card series and the first all-new story based MARS ATTACKS card series in more than half a century! The set boasts all-new art by some of the most renowned illustrators in the industry, including Jusko, Earl Norem, Glen Orbik, Greg Staples, Alex Horley, Sanjulian, Dan Brereton and many more! A limited edition print featuring Joe Jusko's stunning painting will also be available for sale at the Topps booth, signed by the artist, while supplies last!